The award winning Book, Steadfast Christian - A Higher Call To Faith, Family, And Hope, by Patrick Dillon, has won first place honors for the category Religion: Christian Inspirational. Check it out at www.steadfastchristian.com. USABookNews.com, the premiere online magazine and review website for mainstream and independent publishing houses, announced the winners and finalists of The “Best Books 2010” Awards (BBA) on October 26, 2010. Over 500 winners and finalists were announced in over 140 categories covering print and audio books. Awards were presented for titles published in 2010 and late 2009. Jeffrey Keen, President and CEO of USABookNews.com, said this year’s contest yielded an unprecedented number of entries, which were then narrowed down to over 500 winners and finalists. 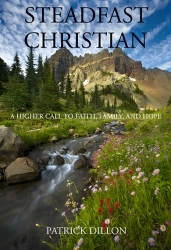 Steadfast Christian – A Higher Call To Faith, Family, And Hope by Patrick Dillon (Outskirts Press) was honored by finishing first place in the category, Religion: Christian Inspirational. To purchase and/or receive more information about this award winning book and to view accompanying videos via YouTube, go to http://www.steadfastchristian.com. You can also purchase this book from Amazon, Barnes & Noble, and other fine retailers. This is a mixture of Holy Scripture, personal perspective, and family stories dating back four generations from the tail end of the Gold Rush, the Great Depression, up to current events. Topics such as Evolution, abortion, voting, peer pressure, baseball, Israel, and the present “great recession” are passionately discussed. A complete list of the winners and finalists of the USABookNews.com National “Best Books 2010” Awards are available online at http://www.USABookNews.com.